The Gibeonites avenged. (1-9) Rizpah's care for the bodies of Saul's descendants. (10-14) Battles with the Philistines. (15-22)1-9 Every affliction arises from sin, and should lead us to repent and humble ourselves before God; but some troubles especially show that they are sent to bring sin to remembrance. God's judgments often look a great way back, which requires us to do so, when we are under his rebukes. It is not for us to object against the people's smarting for the sin of their king; perhaps they helped him. Nor against this generation suffering for the sin of the last. God often visits the sins of the fathers upon the children, and he gives no account of any matters. Time does not wear out the guilt of sin; nor can we build hopes of escape upon the delay of judgments. If we cannot understand all the reasons of Providence in this matter, still we have no right to demand that God should acquaint us with those reasons. It must be right, because it is the will of God, and in the end it will be proved to be so. Money is no satisfaction for blood. It should seem, Saul's posterity trod in his steps, for it is called a bloody house. It was the spirit of the family, therefore they are justly reckoned with for his sin, as well as for their own. The Gibeonites did not require this out of malice against Saul or his family. It was not to gratify any revenge, but for the public good. They were put to death at the beginning of harvest; they were thus sacrificed to turn away the wrath of Almighty God, who had withheld the harvest-mercies for some years past, and to obtain his favour in the present harvest. In vain do we expect mercy from God, unless we do justice upon our sins. Executions must not be thought cruel, which are for the public welfare. 10-14 That a guilty land should enjoy many years of plenty, calls for gratitude; and we need not wonder misused abundance should be punished with scarcity; yet how few are disposed to ask of the Lord concerning the sinful cause, while numbers search for the second causes by which he is pleased to work! But the Lord will plead the cause of those who cannot or will not avenge themselves; and the prayers of the poor are of great power. When God sent rain to water the earth, these bodies were buried, for then it appeared that God was entreated for the land. When justice is done on earth, vengeance from heaven ceases. God is pacified, and is entreated for us through Christ, who was hanged on a tree, and so made a curse for us, to do away our guilt, though he was himself guiltless. 15-22 These events seem to have taken place towards the end of David's reign. David fainted, but he did not flee, and God sent help in the time of need. In spiritual conflicts, even strong saints sometimes wax faint; then Satan attacks them furiously; but those who stand their ground and resist him, shall be relieved and made more than conquerors. Death is a Christian's last enemy, and a son of Anak; but through Him that triumphed for us, believers shall be more than conquerors at last, even over that enemy. Verse 7~David showed loyalty to his oath by showing kindness to Mephibosheth. We want to honor our word too. Lynett, v8 of this chapter explain or answer your question the King David gave Rizpah's two sons Armoni and Mephibosheth King Saul's grandsons to the Gibeonites to be executed. Aiah Saul's wife or concubine gave birth to his daughter Rizpah v8. Glory be to God in the highest through our Lord and Savior Jesus Christ amen! I, like Priclla Everett thank GOD for HIS GRACE. I THANK GOD THAT HE SO LOVED THE WORLD, THAT HE GAVE HIS ONLY BEGOTTEN SON JESUS CHRIST. AMEN!!! Can someone explain the significance of verse 10. Why do you think Rizpah was mentioned ? Thank God for grace, for Jesus Christ who delivered us the law of sin and death. God you imagin, if we were still living in the old testament days, where there is instant judgement for sin. Saul decendants did not agree to Saul killing the Gibeonites, but they still died beacuse of Saul's bad decision. Thank God we are delivered from generational curses. Proverbs 20:7 declares "The just man walketh in his integrity. his children are blessed after him." Unexpected suffering, such as famine, pestilence and persecution, does not negate the promises of God nor does it reduce His ability to keep those people whom He has promised to keep. It is possible that God's promised blessings can intertwine with local or global suffering. When all things work together for the good of God's good children, it does not say that it will look good, always feel good, or be pleasing to our senses at all. God wills it for good; it is up to us to trust in those dark hours when it might appear that all is being lost. He will not leave his children comfortless or disconsolate. It is up to the children to keep steadfast faith when things seem to be against them instead of for them. God cannot lie. It is for us to walk by faith not by sight. We know that we win during and after the crippling, searing tests have all be completed. "In the shadow of his wings there is rest, sweet rest." 2 Samuel 21:1-9 Principle illustrated: David taking responsibility for Saul�s actions which shows David being a man after God�s own heart. There was a famine in the land of Israel because Saul had killed the Gibeonites. David faced the Gibeonites for Saul to see if there was anything that he could do for them. 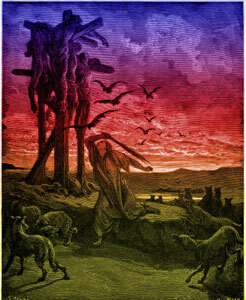 They demanded that he deliver seven men of Saul�s sons to them because they had insisted that they should be destroyed. The Lord chose the men who He wanted David to send. David did not send Mephibosheth because of his oath with Jonathan not to destroy each other�s seed. The Gibeonites would hang those men for what they had done. The consequences from wrong doing can be devastating.. God has brought to my attention that everything I do has an influence on people. I sometimes forget that people look up to me. What I think is �why me?� I am nobody special. I am just a sinner trying to live for God. People notice when you �do� and �do not� do the right thing and live for God. Through my years, I have learned that doing the right thing is what God wants us to do and if we do it we will be set up for the blessings. God blesses and removes the chance of famine when I learn to do what is right. What Do You Think of 2 Samuel 21? How many brothers did Goliath have?